After employees leave your company and no longer contribute to your 401(k) plan, it can be a major chore keeping them on the participant roster. You’re still required to send them participant communications like investment changes and fee disclosures, yet many times old employees simply disappear. Keeping them on the books can be costly too – especially if you’re paying fees per participant. Enter the auto-rollover. Auto-rollovers allow retirement plan sponsors to automatically transfer plan assets of departed employees into an IRA if the participant has a balance of $5000 or less. If they have a balance of $1,000 or less you can even write them a check, and aren’t even required to roll the funds into an IRA. When doing so, you’re technically taking control of your participant’s assets and making an investment decision on their behalf. And of course, you’ll always be required to act in the best interests of the participant. Logistically this means that you’ll need to designate an institution to receive the rollover and decide how the rollover will be invested. The laundry list of requirements above will ensure that your actions qualify for the safe harbor and effectively relieve you of fiduciary duty once the rollover is complete. Keep in mind, though, that your plan must still allow for auto-rollovers to take place in the first place. If your plan document doesn’t allow for auto-rollovers, even though you might qualify for the safe harbor you’d still be in violation of your own plan document, which is a compliance problem of its own. If you have ex-employees you want to roll out but your plan doesn’t allow it, don’t fret. Adding this provision in an amendment can be done without too much hassle. You’ll need to find a reputable third party administrator to ensure your plan stays compliant, but for most small business plans it shouldn’t be too costly (and to be honest, most small business plans already have auto-rollover provisions anyway). Finally, it’s possible that an auto-rollover could trigger a prohibited transaction if done incorrectly. If you, the plan, or your company gets some kind of remuneration from the IRA or annuity provider, you’d be making a prohibited transaction. Remember, you’re still tasked with designating an IRA or annuity provider in the sole interests of your participants. Any type of compensation that doesn’t benefit the participant would be a breach of your fiduciary duty. Typically this would only come into play if you received some kind of referral fee in exchange for selecting a certain financial institution to hold the account. By and large this is only an issue for companies who are in the financial services industry themselves. 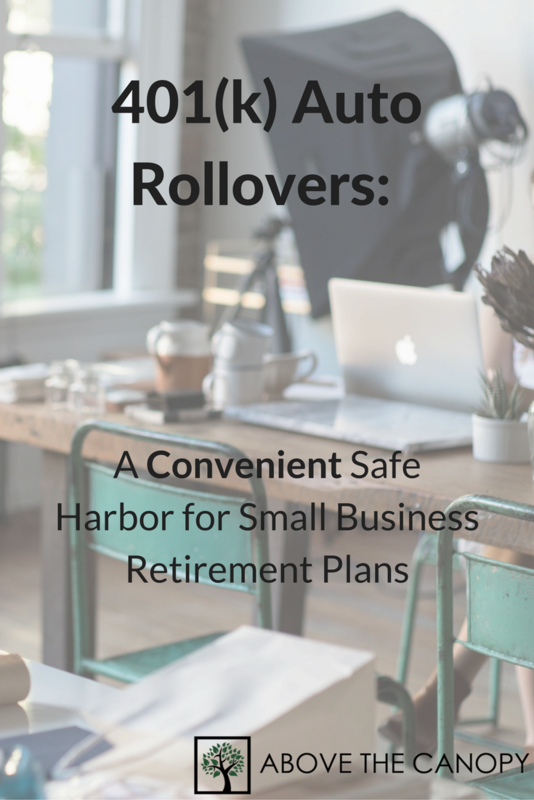 Recordkeepers servicing small business retirement plans are experienced and knowledgeable when it comes to auto-rollovers. For high turnover businesses, it’s probably a good idea to audit your participant roster every year or every few years, and clean up any ex employees with balances under $5,000. Unfortunately you will be required to keep ex-employees in the plan when they’ve accumulated more than $5,000. But for those with less, the safe harbor provides a convenient way to clean up your participant list without the fear of stepping afoul of your fiduciary duties. Posted in Company Retirement Plans, Entrepreneurship, Financial Planning, Retirement and tagged 401k, 401k auto rollovers, auto rollovers, ERISA, ERISA safe harbors, ERISA safe harbors auto rollovers.